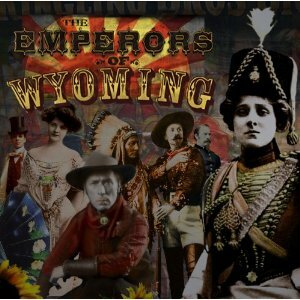 The Emperors of Wyoming are a country/folk rock band. Hearing that then if asked to name some bands they're linked to, its unlikely that you'd pick Nirvana, Sonic Youth, Smashing Pumpkins, House of Pain or Garbage, but linked they are. If you look further down this review at the list of band members you'll notice Butch Vig is the drummer. Butch Vig was a founder member of Garbage and played on all their albums, and as a producer he has worked with numerous bands including those listed above among many others, and was the man who produced Nirvana's Nevermind album. The four band members have known each other since the late 1970's but being in different bands and different parts of the US for the last thirty years it's only now that they've finally managed to all work together. Being based in different places is no longer a barrier to creating an album with the internet allowing ideas and tracks to be shared easily. All four band members have home studios so thye've been able to record their own parts and share them. The results are this debut album. Fans of rock artists such as Tom Petty are likely to really enjoy this album as the styles are very similar. This album has some tracks that could easily be Tom Petty songs as well as some that stray more into the folk or country genres (although the rock influence remains present throughout). This album is a blend of folk, country and rock and has enough to appeal to fans of all three genres. It's an excellent album and one that certainly surprised me and one that I've been listening to a lot lately. "The Emperors of Wyoming" is out on 17th September 2012 via Proper Records.